Home > Market Commentary	> Is the U.S. Economy Growing or Not? Is the U.S. Economy Growing or Not? The recent revision to Q1 real GDP growth, all the way down to a dismal -0.6%, has sparked a debate in the financial media that is somewhere between wild and desperate. CNBC trotted out the usual cast of “experts,” some pontificating that negative GDP growth “didn’t matter,” with others proclaiming that negative GDP growth represented truly good news, as economic activity for the rest of the year was poised to rebound (reminiscent of Liz Ann Sonders’ “coiled spring” hypothesis, which she hyped steadily from 2009 to 2012, before finally letting the meme drop). And just this week, Charles Hugh Smith posted an elegant diatribe (Our “Make it Look Good” Economy Has Failed) in which he claims that the numbers used to portray economic activity have been massaged into a positive narrative that is completely disconnected from reality. 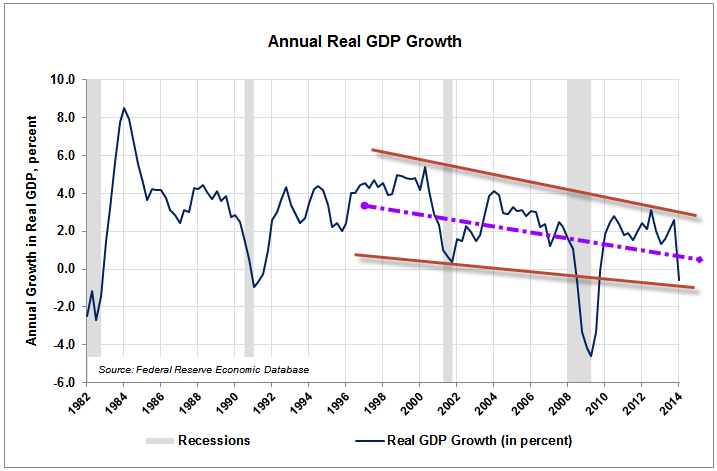 Let’s start with the biggie, growth in real GDP. The graph below shows that growth has been trending inarguably lower since the late 1990s. Next is nominal and real Durable Goods orders. If the following graph were a stock chart, we would immediately recognize a classic “triple top” formation. (The resemblance to the S&P 500 is also clear.) 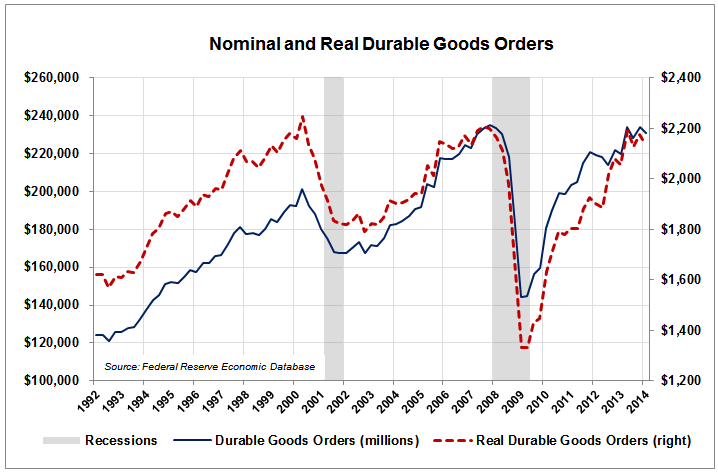 We have achieved the same level of Durable Goods orders as in 2000 and 2008 — with both previous tops immediately preceding recessions! 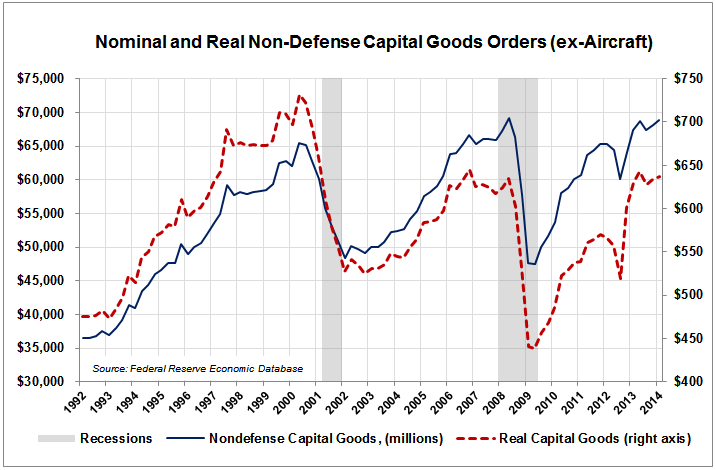 Next we’ll look at real and nominal Capital Goods orders, ex-aircraft to smooth out unusual one-time data points. The real series is in a protracted bear market — not only is the series not growing, it’s clearly shrinking. Capital Goods orders have failed to keep up with inflation (which is negligible, given all the deflationary fears permeating the environment). How about New Building Permits for Private Housing? After all, we’re allegedly in a housing boom, are we not? 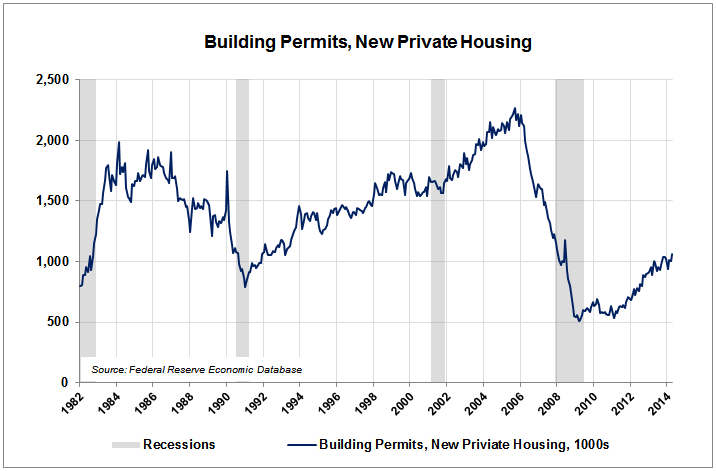 If your definition of “boom” is when builders pull the same level of permits as during the depths of the 1982 and 1991 recessions, then I guess we’re in a boom. Overall, it’s hard to miss Charles Hugh Smith’s point: the trends in these key economic variables are anemic, and bordering on pathetic. Yet, every day now, “the same Broadway kick-line of dancing clowns” (in John Hussman’s words) that told us credit risk was contained in 2008 are telling us that all the numbers are pointing toward sustained economic recovery. All of this makes me nostalgic for the days of relatively harmless memes, like “ketchup is a vegetable.” Now, before you scoff, did you know that the king of condiments was officially classified as a vegetable by a 2011 Senate bill? Maybe all we need is for Congress to pass a law declaring that negative GDP growth is officially good news, and we can all stop worrying. yg berjubah hina ya..x de gaya..macam pakaian orang2 arab.p/s: tunggu le hari kiamat..anda akan dipakaikan pakaian yg di perbuat dari api nemkaa…merancar2 dan bercahaya lagi.